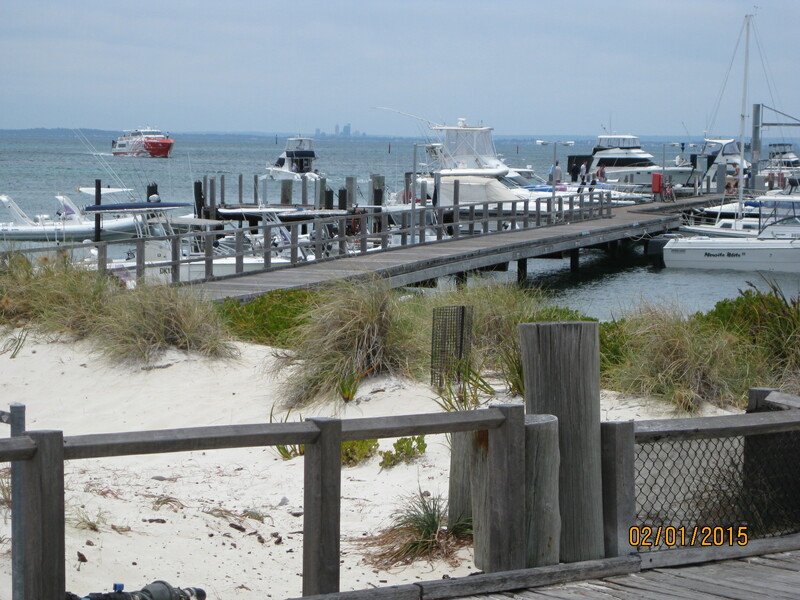 Our fourth and last day in Perth we had taken advice from Trailfinders and pre-booked places on a day excursion to Rottnest Island. At 7.25 am, the bus was on time and by 8.30 am we were glad to be in the queue to board the Rottnest Express. The hour and a half boat journey passed quickly. After such an early breakfast we were ready for a snack and were soon disembarking at the main jetty in Thomson Bay. This fortuitously brought us to a variety of cafes, bars and shops with good quality offerings. Keen to explore and not waste any time on the island, we chose a tasty take-away of freshly baked bread and home-made filling. We ate perched on a low wall in the shade of an overhanging tree, at the same time taking the opportunity to gaze at the pedestrianized shopping and eating areas. A popular way to get about is to hire a bike. Cars are not allowed on the island. There is a bus service but we decided to stretch our legs by taking the road to Thomson Bay North. The path led us past single storey buildings, reminiscent of the holiday camp chalets on the Isle of Wight. Cyclists wheeled by as we stopped to see what a small group of people were doing. 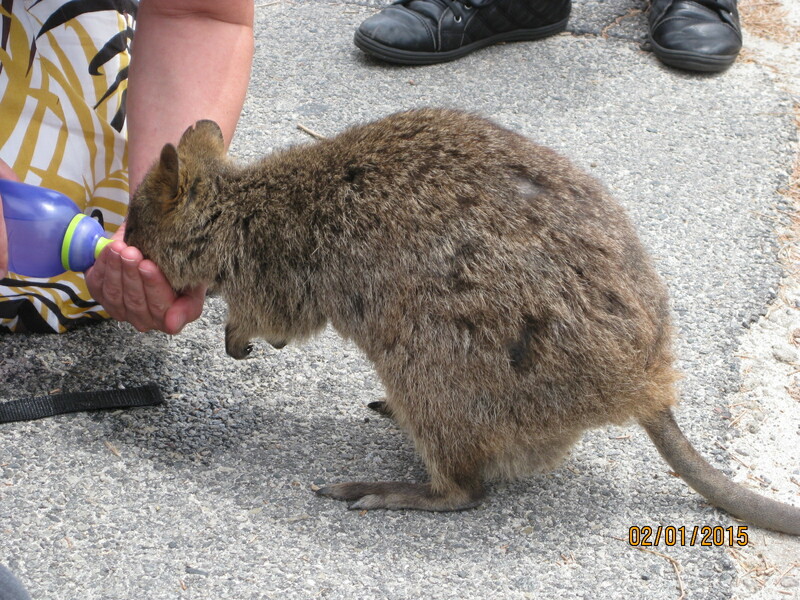 One lady had taken pity on a small animal we later learned was one of the unusual Quokka marsupials on Rottnest. 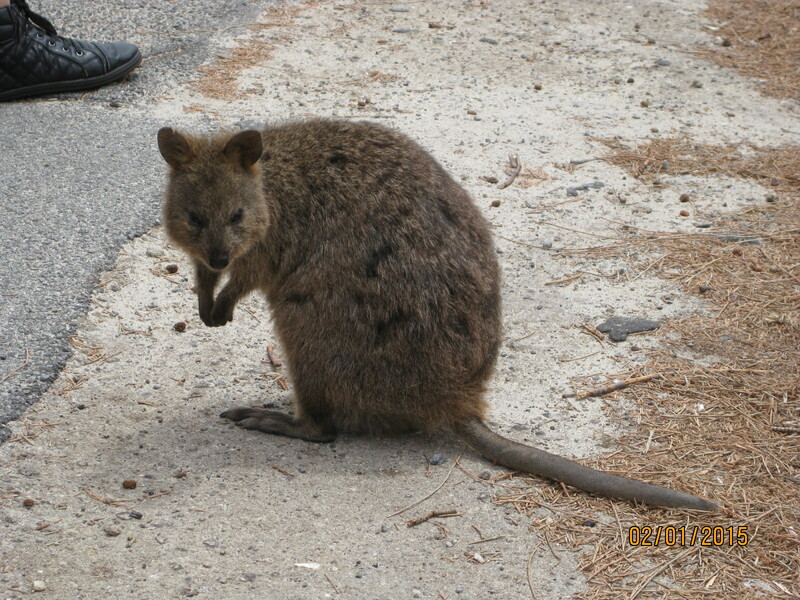 The summer had been unusually hot and dry and the Quokka looked very flea-bitten, certainly I would not have been so generous as to share my water bottle with him. 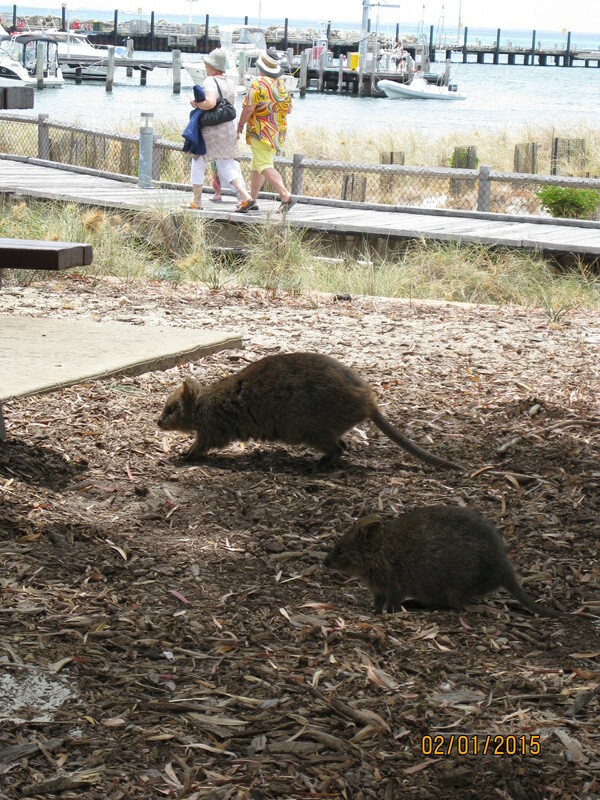 Quokka carry their young in a pouch, as wallabies, but I thought they looked more like large rats. We walked on. I admired the aquamarine and blue sea on our right as we continued uphill. Catching up with a group of walkers in front, we realised it was our Brazilian friend Haroldo with his cousins, whose company we had enjoyed during our evening dinner in the Dubai desert. He turned, immediately recognising us. ‘Hello my friends! How good to see you again. This is our sister, you remember, the reason we travelled from Brazil, to be in Perth with her for New Year.’ We hugged, exchanged pleasantries and discovered we had all visited Kings Park the day before – New Year’s Day – taking advantage of the over 30 degrees centigrade temperature to meander about and make the most of the grassy areas in the sunshine. ‘You must come visit us in Brazil,’ said Haroldo. ‘Thank you, that would be great, but not sure when. Meantime perhaps your next holiday could be a visit to us in England.’ Cards were exchanged and I’m sure we all were wondering whether we would meet again sometime. We did seem to have an affinity as we walked together, admiring the seascape and rocky outcrops with natural vegetation. Arriving at a fork in the track towards the top of the hill, we left the Brazilians to continue to the Bathurst Lighthouse. We returned towards the settlement, exploring the back streets with the Chapel, Museum and Library, and Salt Store dating back to the days when salt was used to trade in the mid 1800s. 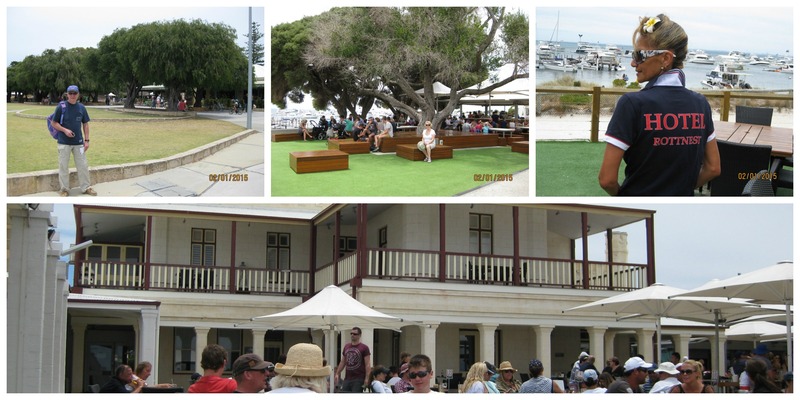 We passed the Dome café and continued by a well-kept lawn leading to the Hotel Rottnest. Resting on a bench shaded by the spreading branches of a giant tree, the enticing aroma of plated lunches – carried by smartly dressed waiters – encouraged us to find a seat. All the outside tables were busy so we sampled their white wine. The wait was worthwhile – the chef knew his trade. The burgers were perfectly cooked to our taste, delicately spiced with accompaniments. Our friendly efficient waitress kindly posed to show off her shirt. Unfortunately we mislaid the paper serviette with her email details during our subsequent travels, so are sorry not to have sent her a copy. ‘That will keep us full until later this evening,’ said Paul. ‘Delicious, that’s better,’ I replied. Looking up the timetable for the Rottnest Island bus tour, we discovered many different activities are available. 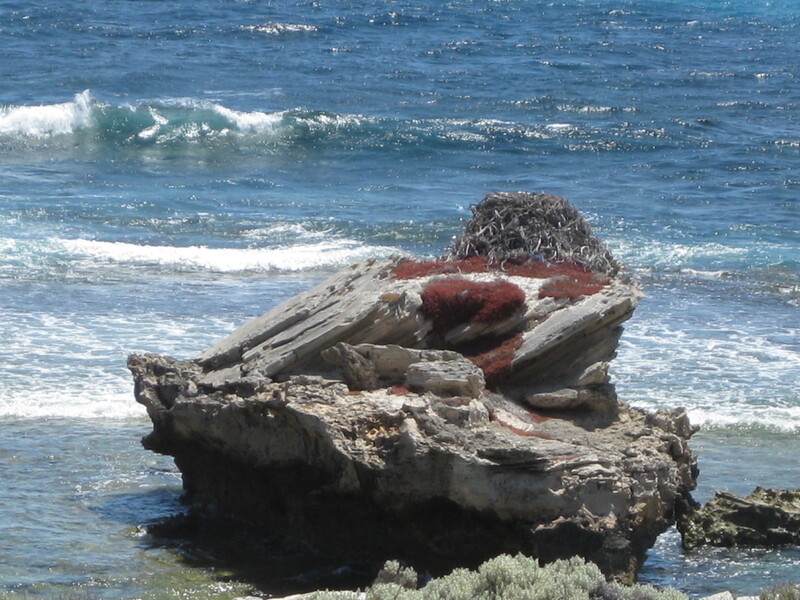 Cycling, walking, camping, backpacking, bird-watching, swimming, snorkelling, scuba diving, or lying in the sun on one of the sandy beaches, all are available on Rottnest. The bus tour allowed time at a variety of viewpoints, including the Bathurst Lighthouse. 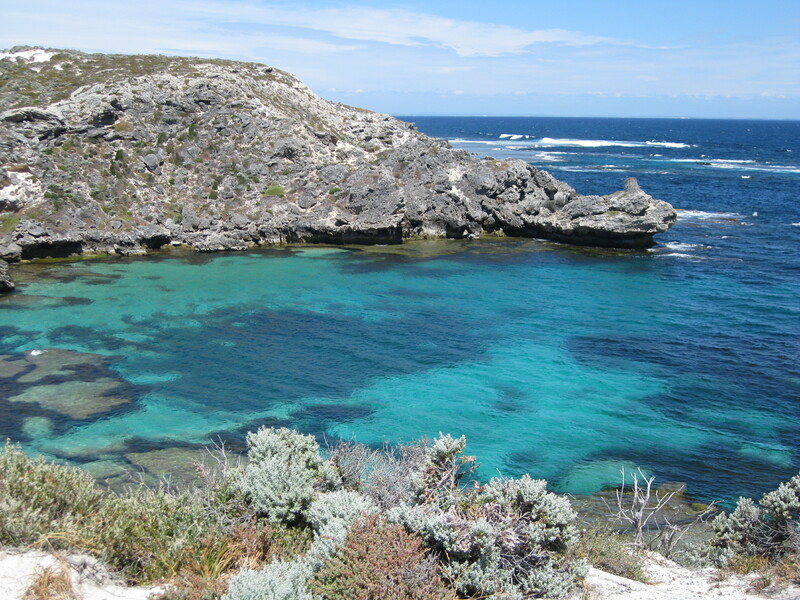 We thoroughly recommend you include at least one day on Rottnest Island when you visit Perth in Western Australia.